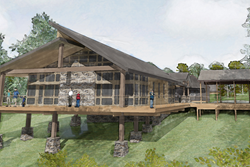 Shaver's Creek Environmental Center, which provides resources for Penn State and local communities, will undergo major expansion and renovation for the first time in more than 75 years. Shaver’s Creek Environmental Center will undergo major improvements and new construction for the first time to help serve the current demand. At Shaver’s Creek Environmental Center, classroom space is often filled to capacity, stretching the limits of the more than 75-year-old facility that has never gone through a major renovation. For the first time, Shaver’s Creek will undergo major improvements and new construction to help serve the current demand. The upgrades will help accommodate the more than 1,300 Penn State students — up from 275 in 2001 — as well as 50,000 non-credit program attendees and nearly 9,000 visitors who use Penn State’s outdoor education field lab and nature center during the year. For Penn State, Shaver’s Creek is home to more than 35 credit-bearing courses in six colleges and nine departments. McLaughlin said the improvements will help the facility continue its mission of outreach and instruction. The original building at Shaver’s Creek, which was founded in 1976, was built in 1938 as a forestry lodge for group functions and warm-weather instruction. Shaver’s Creek provides several resources for Penn State students and the community, including the environmental and raptor centers, outdoor school and public festivals.